A game show is a type of radio, television, or internet programming genre in which contestants, television personalities or celebrities, sometimes as part of a team, play a game which involves answering questions or solving puzzles usually for money and/or prizes. Alternatively, a gameshow can be a demonstrative program about a game (while usually retaining the spirit of an awards ceremony). In the former, contestants may be invited from a pool of public applicants. On some shows, contestants compete against other players or another team, while other shows involve contestants playing alone for a reward or a high score. Game shows often reward players with prizes such as cash, trips and goods and services provided by the show's sponsor prize suppliers, who in turn usually do so for the purposes of product placement. One of the reasons that television broadcasters make game shows is because they are substantially less costly than producing scripted drama shows. Some TV game shows fall under the category of reality television. Television game shows descended from similar programs on radio. The very first television game show, Spelling Bee, was broadcast in 1938. Truth or Consequences was the first game show to air on commercially licensed television. Its first episode aired in 1941 as an experimental broadcast. Over the course of the 1950s, as television began to pervade the popular culture, game shows quickly became a fixture. Daytime game shows would be played for lower stakes to target stay-at-home housewives. Higher-stakes programs would air in primetime. During the late 1950s, high-stakes games such as Twenty One and The $64,000 Question began a rapid rise in popularity. However, the rise of quiz shows proved to be short-lived. In 1959, many of the higher stakes game shows were discovered to be rigged and ratings declines led to most of the primetime games being canceled. An early variant of the game show, the panel game, survived the quiz show scandals. On shows like What's My Line?, I've Got A Secret and To Tell The Truth, panels of celebrities would interview a guest in an effort to determine some fact about them; in others, celebrities would answer questions. Panel games had success in primetime until the late 1960s, when they were collectively dropped from television because of their perceived “low budget” nature. Panel games made a comeback in American daytime television (where the lower budgets were tolerated) in the 1970s through comedy-driven shows such as Match Game and Hollywood Squares. In the UK, commercial demographic pressures were not as prominent, and restrictions on game shows made in the wake of the scandals limited the style of games that could be played and the amount of money that could be awarded. Panel shows there were kept in primetime and have continued to thrive; they have transformed into showcases for the nation's top stand-up comedians on shows such as Have I Got News for You, Would I Lie to You?, Mock the Week, QI and 8 Out of 10 Cats, all of which put a heavy emphasis on comedy, leaving the points as mere formalities. The focus on quick-witted comedians has resulted in strong ratings, which, combined with low costs of production, have only spurred growth in the UK panel show phenomenon. Game shows remained a fixture of US daytime television through the 1960s after the quiz show scandals. Lower-stakes games made a slight comeback in daytime in the early 1960s; examples include Jeopardy! which began in 1964 and the original version of The Match Game first aired in 1962. Let's Make a Deal began in 1963 and the 1960s also marked the debut of Hollywood Squares, Password, The Dating Game and The Newlywed Game. Though CBS gave up on daytime game shows in 1968, the other networks did not follow suit. Color television was introduced to the game show genre in the late 1960s on all three networks. The 1970s saw a renaissance of the game show as new games and massive upgrades to existing games made debuts on the major networks. The New Price Is Right, an update of the 1950s-era game show The Price Is Right, debuted in 1972 and marked CBS's return to the game show format in its effort to draw wealthier, suburban viewers. The Match Game became "Big Money" Match Game 73, which proved popular enough to prompt a spin-off, Family Feud, on ABC in 1976. The $10,000 Pyramid and its numerous higher-stakes derivatives also debuted in 1973, while the 1970s also saw the return of formerly disgraced producer and host Jack Barry, who debuted The Joker's Wild and a clean version of the previously rigged Tic-Tac-Dough in the 1970s. Wheel of Fortune debuted on NBC in 1975. The Prime Time Access Rule, which took effect in 1971, barred networks from broadcasting in the 7-8 p.m. time slot immediately preceding prime time, opening up time slots for syndicated programming. Most of the syndicated programs were "nighttime" adaptations of network daytime game shows; these game shows originally aired once a week, but by the late 1970s and early 1980s most of the games had transitioned to five days a week. Game shows were the lowest priority of television networks, and were rotated out every thirteen weeks if unsuccessful. Most tapes were destroyed until the early 1980s. Over the course of the late 1980s and early 1990s as fewer new hits were produced, game shows lost their permanent place in the daytime lineup. ABC transitioned out of the daytime game show format in the mid-1980s (briefly returning to the format for one season in 1990 with a Match Game revival). NBC's game block also lasted until 1991, but the network attempted to bring them back in 1993 before cancelling its game show block again in 1994. CBS phased out most of their game shows, except for The Price Is Right, by 1993. To the benefit of the genre, the moves of Wheel of Fortune and a modernized revival of Jeopardy! to syndication in 1983 and 1984, respectively, was and remains highly successful; the two are, to this day, fixtures in the prime time "access period". Cable television also allowed for the debut of game shows such as Supermarket Sweep (Lifetime), Trivial Pursuit and Family Challenge (Family Channel), and Double Dare (Nickelodeon). It also opened up a previously underdeveloped market for game show reruns; general interest networks such as CBN Cable Network and USA Network had popular blocks for game show reruns from the mid-1980s to the mid-'90s before that niche was overtaken by Game Show Network in 1994. After the popularity of game shows hit a nadir in the mid-1990s United States (at which point The Price Is Right was the only game show still on daytime network TV), the British game show Who Wants to Be a Millionaire? began distribution across the globe. Upon the show's American debut in 1999, it was a hit and became a regular part of ABC's prime time lineup until 2002. Several shorter-lived high-stakes games were attempted around the time of the millennium, both in the United States and the United Kingdom, such as Winning Lines, The Chair, Greed and Shafted, leading to some dubbing this period as "The Million-Dollar Game Show Craze". These higher stakes contests also opened the door to reality television contests such as Survivor and Big Brother, in which contestants win large sums of money for outlasting their peers in a given environment. Several game shows returned to daytime in syndication during this time as well, such as Family Feud, Hollywood Squares, and Millionaire. 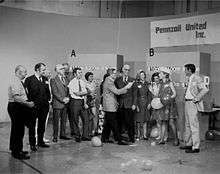 The popularity of game shows in the United States was closely paralleled around the world. Reg Grundy Organisation, for instance, would buy the international rights for American game shows and reproduce them in other countries, especially in Grundy's native Australia. In the United Kingdom, game shows have had a more steady and permanent place in the television lineup and never lost popularity in the 1990s as they did in the United States, due in part to the fact that game shows were highly regulated by the Independent Broadcasting Authority in the 1980s and those restrictions were lifted in the 1990s, allowing for higher-stakes games to be played. Game shows have had an inconsistent place in Canadian television, with most homegrown game shows there being made for the French-speaking Quebecois market and the majority of English-language game shows in the country being rebroadcast from, or made with the express intent of export to, the United States; there have been exceptions to this (see, for instance, the long-running Definition). Unlike reality television franchises, international game show franchises generally only see Canadian adaptations in a series of specials, based heavily on the American versions but usually with a Canadian host to allow for Canadian content credits. The smaller markets and lower revenue opportunities for Canadian shows in general also affect game shows there, with Canadian games (especially Quebecois ones) often having very low budgets for prizes, unless the series is made for export. Canadian contestants are generally allowed to participate on American game shows, and there have been at least three Canadian game show hosts; Monty Hall, Jim Perry and Alex Trebek; that have gone on to long careers hosting American series. In the US, CBS is currently the only major network airing daily national game shows. It still airs The Price Is Right and, as of 2009, is also airing a revival of Let's Make a Deal. Deal airs on weekdays at a time chosen by each CBS affiliate, while Price airs weekdays at 10am or 11am in most markets. Although ABC does not air any daily national game shows, they revived four classic game shows for weekly prime time airing during the summer. These shows are Celebrity Family Feud in 2015 as well as To Tell The Truth, The $100,000 Pyramid and Match Game in 2016. In addition, ABC's syndication wing Disney-ABC Domestic Television distributes Who Wants to Be a Millionaire?, and many of their local affiliates air it in syndication. The oldest, continually aired radio quiz show in the United States was Simply Trivia, which aired on public radio station WYSO in Yellow Springs, Ohio; it ran from 1972 through 2014. Many of the prizes awarded on game shows are provided through product placement; although in some cases, they are provided by private organizations or purchased at either the full price or at a discount by the show. There is the widespread use of "promotional consideration", in which a game show receives a subsidy from an advertiser in return for awarding that manufacturer's product as a prize or consolation prize. Some products supplied by manufacturers may not be intended to be awarded at all, and are instead just used as part of the gameplay (such as the low-priced items used in several Pricing Games of The Price Is Right). For high-stakes games, a network may purchase prize indemnity insurance to avoid paying the cost of a rare but expensive prize out of pocket. If said prize is won too often, the insurance company may refuse to insure a show (this was a factor in the discontinuation of The Price Is Right $1,000,000 Spectacular series of prime-time specials; three contestants had won the top prize in a five-episode span after fifteen episodes without a winner, due in large part to a change in the rules, and the insurance companies had made it extremely difficult to get further insurance for the remaining episodes). A network or syndicator may also opt to distribute large cash prizes in the form of an annuity, spreading the cost of the prize out over several years or decades. From about 1960 through the rest of the 20th century, American networks placed restrictions on the amount of money that could be given away on a game show, in an effort to avoid a repeat of the scandals of the 1950s. This usually took the form of an earnings cap that forced a player to retire once they won a certain amount of money or a limit of how many episodes (usually five) a player could appear on a show. The introduction of syndicated games, particularly in the 1980s, eventually allowed for more valuable prizes and extended runs on a particular show. Likewise, British television was under strict regulations, even more strict than those on the American side of the Atlantic Ocean, on prizes until the 1990s; these limits seriously restricted the value of prizes that could be given and did not allow games of chance to have an influence on the outcome of the game (thus the British version of The Price Is Right at first did not include the American version's "Showcase Showdown," in which contestants spun a large wheel to determine who would advance to the Showcase bonus round). The lifting of these restrictions in the 1990s was a major factor in the explosion of high-stakes game shows in the later part of that decade in both the U.S. and Britain (and, subsequently, around the world). The game play of a bonus round usually varies from the standard game play of the front game, although there are often borrowed or related elements of the main game in the bonus round in order to ensure the entire show has a unified premise. Though some end games are referred to as "bonus rounds", many are not specifically referred to as such in games, though they fit the same general role. Until the 1960s, most game shows did not offer a bonus round. In traditional two-player formats, the winner — if a game show's rules provided for this — became the champion and simply played a new challenger either on the next show or after the commercial break. The end game of Match Game served as the impetus for a completely new game show. The first part of Match Game's bonus round, called Audience Match, asked contestants to guess how a studio audience responded to a question. In 1975, Goodson decided that this line of questioning would make a good game show of its own, and the concept eventually became Family Feud. 1 2 3 Graham, Jefferson, "Come On Down!!! The TV Game Show Book," Abbeville Press Publishers, New York, 1988.